What an evocative picture, I do like it. Your caption does not give a date for the period which is represented in the painting, any idea as to when? Ah yes, I meant to put that in, but was a little bleary eyed at the time. I can give a precise year, that being 1885. Hi. I am Jack Hill’s daughters. Unfortunately he died suddenly in 1979. He lived in Bury St Edmunds, Suffolk. My sister and I obviously have the large Picture Book, and also several duplicates in the form of prints. Hi Rosina, Sorry for the delay in replying. Many thanks for your comment. After all these years, long after his passing, your father’s paintings continue to inspire which must be the legacy all artists aspire to. What’s the location of the painting? Looks like the Moorgate junction at Farringdon but the District line train being there is confusing me. 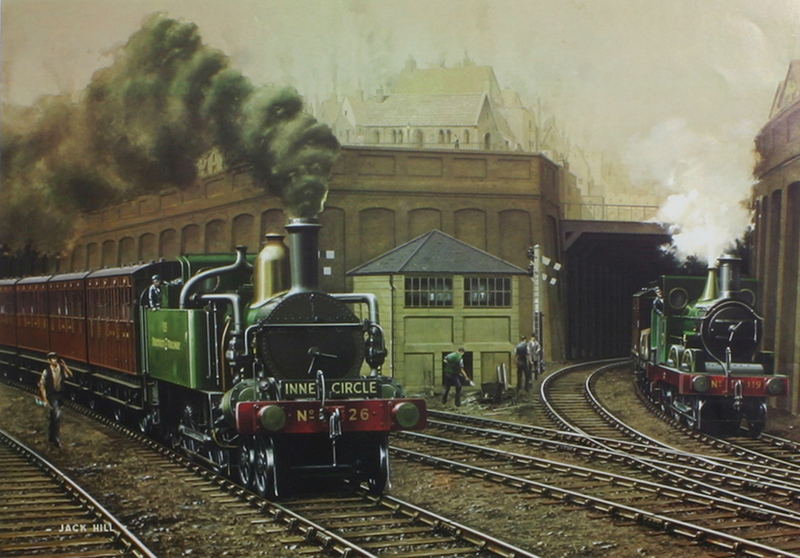 From the completion of the Inner Circle up to about 1900, the running arrangements appear to have allowed the two companies to run trains in numbers proportional to their ownership of the track. The Metropolitan owned more than half the track, so ran all the trains clockwise (on the outer rail), plus a few anti-clockwise on the inner rail, whereas the Metropolitan District Railway ran solely anticlockwise on the inner rail. From 1900 the arrangement appears to have changed and they both ran on the inner and outer rails, presumably though, still proportionally to the rail owned, though I have seen reference to them also claiming a proportion of total receipts according to mileage owned. It all needs more research at some point! I have been rather “taken” with this painting and I thought that I would like to know more about the artist…. Well Google / Yahoo / Search-Me found lots of obscure web-sites for me to visit and the only “artist” by the name of Jack Hill turned out to be a sculptor. So, let us do justice to the painter of this evocative scene…. where can one find out more about the man and / or his paintings? Thank you for posting this print; it’s certainly full of atmosphere. I’ve got a poor version of it on the back of the dust jacket of “The Golden Years of the Metropolitan Railway” (Edwards & Pigram, Bloomsbury, 1983) and although as published it cuts off the artist’s name I guessed immediately that it was Jack Hill. The caption states that it depicts the junction at Aldgate, which puzzled me for a while – rotating old maps, checking the direction of Met.District trains – but then realised that it was a “typo” for Aldersgate, that confirmed by the map in “Steam on the Widened Lines” by Geoff Goslin. In the past I’ve had several attempts at finding out more about Jack Hill, with no success. I’ve got two other prints (both in small books) by him and they show great attention to detail, without looking like photographs, but at the same time are believable. One is of a “Gladstone” at speed and the other of Ostend Maritim during Belgium’s “Caledonian” period – but no square chimney in sight. Incidentally, I do think that some painters add too much smoke, especially where circumstances don’t require it. (At least JH is good at smoke, whereas most aren’t.) Perhaps this come from the days of Bishop Treacy, when it was rumoured that he gave “beer money” – just a few bob – to enginemen to make smoke at the location he would be at taking photos at. Apologies if this is too long and wittery for “Basilica”. Thanks Mike. Jack Hill prints come up on ebay from time to time under collectables > transportation > railwayana, and at the time of writing there are three. IIRC there was a large book published in the mid-70s of his work, with text by OS Nock. All the prints I’ve seen are the same size including the antique gold surrounds, so perhaps they’ve been filleted from this source? In my opinion JH is one of the better railway painters, avoiding the twee, and as you say, he’s good at smoke. Dad’s a watercolour artist (very different media, very different style) but holds JH’s paintings in high regard. Beautiful Painting! Is it available as a frame-able print? I have a book called The Railway Lovers companion with a gobsmacking Jack Hill painting on the dust jacket. Wouldn’t i just love to have a nice big print of that on my wall! Thank you for showing this one. I think my print came from an old book (but not that old – it’s younger than me!) The Railway Picture Book by Jack Hill and OS Nock – but these days copies go for silly money; the cheapest I can find at the moment is a shade under £30, but prices extend up into three figures before the decimal. My single print came from ebay and was about a fiver. Worth keeping an eye out for another. I have the above Jack Hill print framed and its in mint condition…am putting it on ebay soon unless somebody is interested in it..also have another…they were my grandads who has now sadly passed away. I have a small signed pencil/charcoal sketch by Jack Hill given to my father when he left the electricity board, at Playfields, probably late 1950’s early 1960’s? it is signed by jack and other work colleagues. Jack was a draftsman in the same office as my father Neville Hibberd for about three years in the main division of the electricity board at Bury. My dad still recalls this and recollects the other nine people who signed the drawing, his leaving gift. Hoped you might be interested. Hello Andy. I remember your Dad. A nice looking man from memory! We have several similar leaving cartoon drawings. Also my sister Tessa passed away in Calgary last week. So eventually I am sure we will find she has lots of Dads books etc rout there. I guess you, like us, used to go to the EEb Children’s parties in the Coop Hall. Dad was often Santa. Does anyone know whether Jack ever had prints made of his pictures that appear in O S Nock’s Railway Race to the North? I suspect that Jack painted these for Ossie Nock, who then used them in his book. Unfortunately all but one are monochrome, and I woukld like to have them in colour. Contrary to my hopes, none of these appear in The Railway Picture Book. Jack Hills daughter here. I am going through Dad’s books etc. If I come across any separate prints I will let you know. Also my sister in Canada passed away recently, and we may find more amongst her possessions. Dad wouldn’t want us to profit from his prints, so if we find any then a small donation to a charity would be appreciated. Thank you. Thank you very much for responding. I am sorry to hear about your sister. Your father’s pictures have so much atmosphere in them; this is often lacking in the work of other artitsts – my brother, for example, never quite seems to obtain this. Best wishes. I have found a 8″ x 6″ print of Dads, presumably from a book. Premier Line “Whitworth” and a “”Jubilee” Camden bank 1898 if anyone would like this. I am tempted for the art rather than the railway. If no one else comes forward then yes please. My prime interests are Great Western and Great Central so please consider me if anything comes up in those areas. Ok Graham. I’ll bear you in mind. Many thanks Rosina! I live in South Wales, 49 Honeysuckle Way, Brackla, Bridgend, CF31 2NT. I will make a donation as you suggested. Hi. I’ll send you the print Charless, foc. How shall we go about posting this to you?